Rory's Story Cubes is a pocket-sized creative story generator, providing hours of imaginative play for all ages. 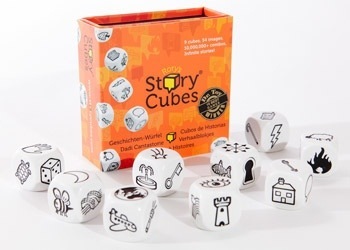 With Rory's Story Cubes, anyone can become a great storyteller and there are no wrong answers. Simply roll the cubes and let the pictures spark your imagination! The secret is not to think too deeply. Simply ‘gulp’ in the images and start talking. The story will reveal itself through the cubes and in so doing, will unleash creativity, freedom of expression and frequently, an insight to how to solve a seemingly intractable personal or business problem. Calling Rory’s Story Cubes a game is potentially misleading, but then again, it’s not not a game. For under $10 (I bought mine at Target for $6.99), you get a set of 9 six-sided dice. Each side of every die has a unique image on it, which means you have 54 images total. Wow! To play, you roll the dice, look at the images rolled, and create a story. You can also use this to help you with writer’s block. Or to prototype a design. Or just to roll and see what your imagination creates. I think this is a wonderful toy. The dice are big and high quality. The images are varied and the breadth of combinations means you’ll always see something new. I’m a designer, a child at heart, and someone who loves the value of meaningful play. Because of that, Rory’s Story Cubes is a winner. Rory’s Story Cubes is a set of dice that, as the game’s title suggests, can be used to tell stories. Created by The Creativity Hub and published most places by Gamewright, the set is designed to spur a roller’s imagination by giving him a set of elements to include in his story. As a game, it is at best “rules lite,” coming more with guidelines than actual rules, such that it might be better classed as a tool or a toy. Now doubtless, you can do better. And you are welcome to try with your own set of Rory’s Story Cubes. How you do that is entirely up to you, as the extent of the rules in the “game” merely suggest that the stories can either be told solitaire or co-operatively. The problem with this is that it means that as a game, Rory’s Story Cubes lacks the structure that would make it game, because this is essentially not only “use the dice to make up the stories you want,” but also “make up the rules to how you tell those stories.” Arguably then, not sufficient enough to make it a game given its need for further input from the participants. Plus, the clue is in the title – Rory’s Story Cubes, not Rory’s Story Dice. After all, “Dice” infers a game, whereas “Cubes” do not. As a tool or a toy, Rory’s Story Cubes is much better. The images on the dice are large, friendly, and universal. Although due to their size, the dice feel a bit too much to all together fit in the hand, they possess a satisfying weight and heft. They would work well as an educational tool, whether that is in an education establishment, or simply as a means to spur your child’s imagination and thinking. There is much to like about Rory’s Story Cubes. The dice are themselves physically pleasing and the concept sound. More rules would have made them even more pleasing, but as long as the users or players are happy to agree on the rules as to how they can tell their stories, then they are ready to roll their imaginations with Rory’s Story Cubes. As a bilingual education teacher, I’ve used these cubes in my classes multiple times with a lot of success. Every time I’ve used them, I’ve found a higher than normal amount of student engagement. They’re great for getting the students to think in the target language since there are only images on each side of the cube. Even the emerging readers are able to use them. As a writer, I find that these cubes are great to use to spur my imagination that little bit more. If I’m stuck with a scene or just want to free write, I’ll only roll one or two cubes and use them for 200-500 words as inspiration. As a mother, watching my child come up with stories based on the pictures was fantastic. My daughter has used the cubes since before she could read. She would roll and I’d write down the stories she told. Later we would read the story together. Now that she’s an emerging reader, she writes down parts of her own stories. Overall, I’d give the cubes 8.5/10. Roll the dice, tell a story using all the dice. Or divide the dice up between the group, and take turns rolling and adding to a growing story. That’s it, and that’s all it claims to be/needs to be. My 7 year old daughter uses these to “teach” the four year old next door how to take turns, and how to male up stories. That girl comes over daily and asks to play with the story cubes. They will sit for an hour, telling all sorts of fantastical tales, it’s a joy to listen to them. Every preschool, daycare, and elementary teacher/provider should have these. Added bonus: Throw these onto the table with a few drinking (or silly/creative minded) adults, and you have a great party activity/icebreaker (especially with the Actions! cubes, and acting them out…lol). I initially held off buying this for my kids as they had wicked imaginations and told me fantastic tales from there “own heads” as they put it. However these dried up – my youngest informing me that he wasn’t able to unlock any more(!!) – so I got the Story Cubes for them as a reward. They’ve been fantastic in getting their imaginations going again. We’ve had some weird and wonderful stories told (even by Mum and Dad!) and they get more and more involved as their confidence grows. That’s one of the great aspects to this ‘toy’ you can interpret the symbol in which ever way you want. These are a fantastic tool to help kids (or adults) find or regenerate their imagination. In this game you need to have some imagination. All you need to do besides that is have a good hand for rolling dice. You simply roll the dice, and start making a story out of the images that turn up. Of course you need to be quick, have your wits about you. It`s fun and entertaining, especially at night. The symbols on the dice open up for a lot of interpretations, and you need to be spontanous in driving the story forward. In all probability it`s more like a party game, rather than anything else. It`s a quick filler game, especially at night, with a glass of wine on the side. Add a Review for "Rory’s Story Cubes"